" I am a 16 year old multi-instrumental musician. 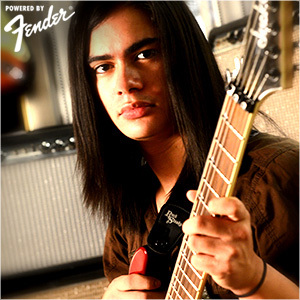 I am trying to build a name for myself, with the help of Fender and Guitarcenter. " I am a 16 year old multi-instrumental musician. I am trying to build a name for myself, with the help of Fender and Guitarcenter. Started guitar when i was 11. Just a little California Stratocaster. Began to look into finger placement, all the different chords, picking motions, even different types of guitars. Gave myself about two years before taking everything seriously, i finally realized there is a world out there that i can be a part of. I would lock myself in my room and play for hours and hours. I stopped playing outside with my friends for a long time, that’s how much I played. At the age of 13 i started getting familiar with the guitar just a bit more and attempted to compose music on the guitar. To this day i still remember my first song. My uncle is a Sound Engineer. He helped me record my song. At the age of 14, the Las Vegas School of Rock was brought to my attention. I have seen the movie a billion times, but never knew it was a real program! My mother and i walked in and instantly i had a connection to the school. They all seemed to love me. I then signed up and attended the very next Saturday when it officially opened. SOR has opened many doors for me. My VERY first gig was at the Hard Rock Cafe on the Las Vegas Strip, in 2012. And more and more shows after that. Robert M. Knight, a legendary rock photographer approaches me in the school of rock, introduces himself and becomes a big motivator towards my musical goal. He introduced me to an amazing program called Bbrotherhood of the Guitar”. This gave me many opportunities to do exactly what i want to do, and be who I want to be. He explained all of the details and everything is great! It’s really the best opportunity for any young guitarist to get some exposure, especially with Fender and GuitarCenter backing you up. 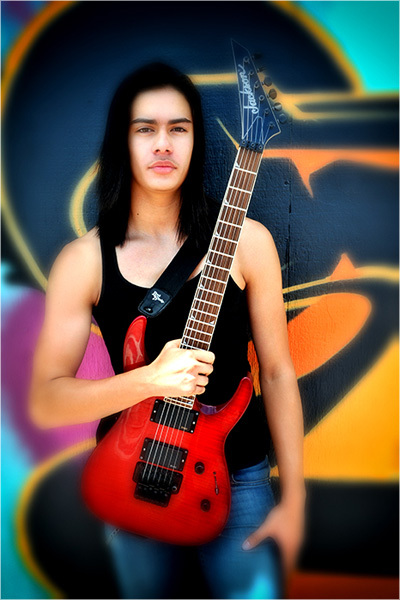 Since October of last year (2012) i have been playing Jackson Guitars. Really great guitars for that heavy tone everyone likes, and they feel great in my hands! It’s nice to have such great people watching over me and I promise, i won’t let anyone down!